Chandigarh: Fresh firing took place on Monday in Haryana’s Sonipat district as Jats demanding job quotas blocked the Delhi-Ambala highway, hours after traffic on it was restored. Meanwhile, the death toll in the nearly 10 days of violence was put at 16. Police sources said the Jat demonstrators fought pitched battles with soldiers by hurling stones and bricks near Ladsoli village, 55 km from New Delhi. The army fired at the Jats, leaving a few injured, the sources said, after they blocked the National Highway-1 again. Education Minister Ram Bilas Sharma meanwhile said that the Haryana violence had left 16 people dead. He said the cabinet discussed the latest situation in the state. The army also took control of the Munak canal in Sonipat district earlier in the morning. The canal supplies water supply to Delhi, and the supply of water resumed partially to the national capital. Delhi Chief Minister Arvind Kejriwal thanked the army for its intervention. “Thank u army, thank u centre for securing Munak canal. Great relief for Delhi,” he tweeted. Rohtak and some other places remained tense due to fresh incidents on Monday. Police sources said Jats continued to block roads and railway tracks at some places on Monday. Former chief minister and Congress leader Bhupinder Singh Hooda was stopped by security forces at the Tikri border (between Delhi and Rohtak) on Monday while proceeding towards strife-torn Rohtak town. The violence affected areas in the state were meanwhile limping back to normalcy. Curfew in Rohtak town was relaxed for an hour. Curfew was lifted in Hisar and Hansi towns, officials said. Soldiers and paramilitary troopers along with police and district authorities continued to patrol the NH-1 and other roads to ensure that the Jat protestors did not return. Thousands of people and vehicles were stranded on NH-1 as the Jats laid siege to the highway in Sonipat and Panipat districts for three days, cutting off road connectivity to Haryana, Punjab, Himachal Pradesh, Jammu and Kashmir and Chandigarh. Railway officials said restoration of train traffic on the Delhi-Ambala and Delhi-Bathinda sections could take some more time as the damaged tracks have to be repaired. The demonstrators had uprooted railway tracks at various places. Nearly 900 trains were cancelled in the region due to the Jat agitation. The protests somewhat abated after Haryana’s ruling Bharatiya Janata Party announced in Delhi on Sunday that Jats will get reservation in jobs, police officials said. In some places, however, Jat youths continued the blockades saying they won’t budge till they see “action” by the Haryana government. 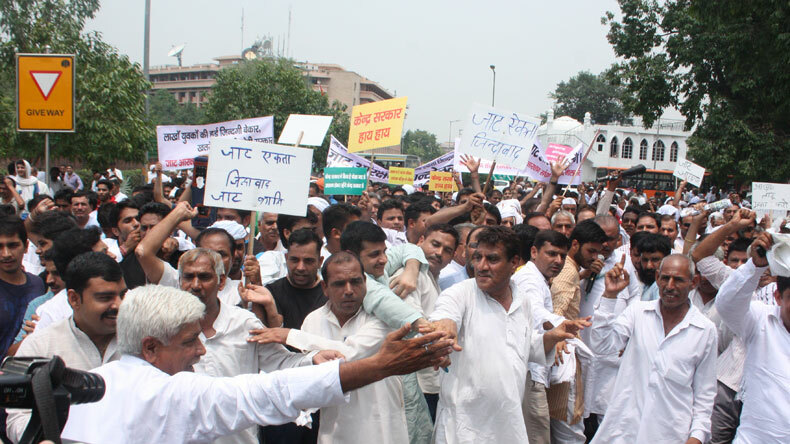 Jat leaders have appealed for an end to the agitation. Hundreds of shops have been vandalised and set on fire in Rohtak, Bhiwani, Jhajjar, Kalanaur and other places. A number of government and private buildings and vehicles were also set on fire in the past four days as mobs went on the rampage in over 10 districts in Haryana. The state government had to requisition the army and para-military forces to contain the situation. However, the violent protests continued and even spread to other areas of the state.